Aloe Vera Shared House i Tenerife, Spanien: Reservér nu! Welcome to our little kingdom in south Tenerife! We are a cozy, and quiet eco-villa. Located just in front of a beautiful sand beach and a small natural park, we provide our guests with a home base for exploring the area, enjoying the year-round sun and the beach, the natural beauty of our surroundings, and all the activities that can be organized here, such as snorkeling, hiking, surfing, diving, kite-surfing, wind-surfing, airsoft, or beach volley. We are not a party hostel. Instead, this is a place for those looking for something more comfortable and quiet, who still want to meet new people over their stay. Here, you can be active during the day, or just sunbathe and chill in our patio, take a dip in our pool, or enjoy the sea and Teide view from our rooftop. We are very green. We recycle, provide free drinkable water trough our own filter system, heat our water with sun energy, get supplied only with green electricity, and all our furniture comes from sustainable managed forests. 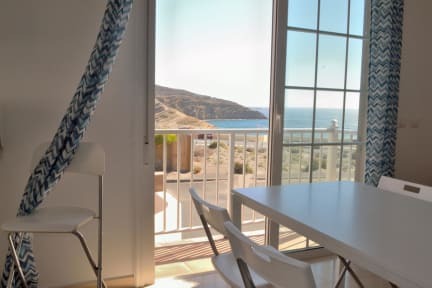 We are located at the edge of El Medano town, so despite being based in front of the beach and a natural park, we are also at a 10 minutes drive from the airport (aprox 15 euro taxi), 10 minutes walk from the closest supermarket and ATM, and 20 minutes walking (or 5 minutes bike) from el Medano downtown and all its bars and restaurants. We are also just in front of the bus stop. We have two 8 people dorms, one 6 people dorm, and one 4 people dorm. All dorm are mixed, equipped with bunk beds. All the rooms have curtains, and all the beds have their two own electric plugs. Aloe Vera Shared House Policies and Conditions. Check in from 14:00 to 1:30 . The reception will be open 08.30 to 23.00.